Q. 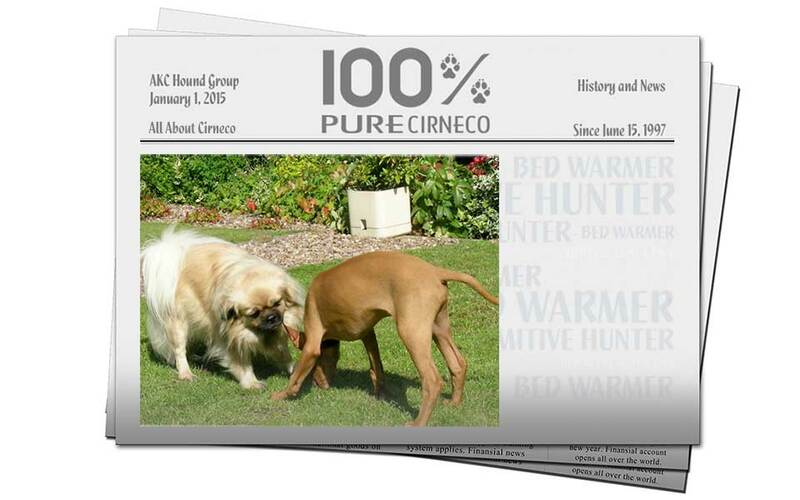 When introducing a new dog, adult or puppy, into the household with a Cirneco, what should we take into consideration before bringing home the new pet, how should they be introduced, what behavioral indicators should we be aware of or watch for to avoid possible conflicts or aggression? A. The arrival of a new pet in the household will cause upheaval for all concerned – pets and family. It is always best to make gradual introductions, at first keeping the new addition separate unless supervised and introduce them to a multi-dog household one dog at a time. The new pet should be kept in a neutral area of the home (that is not in a place that the resident dog considers “valuable”; (this varies, it could be the kitchen or the bedroom or any special resting place)) leaving the resident pet all usual access. If the resident dog is usually crated it is a good idea to place the new pet in a crate not too close to the resident pet to begin with, and gradually move the crates closer as they habituate to each other. The bedding of the new pet should be bedding used by the resident pet so that the new pet takes on a familiar scent. Always choose moments when all is calm in the household to make introductions; avoiding exciting the pets. If problems are anticipated the introduction should be with all pets on a lead, preferably outside and with another person holding one of the dog’s leads. The people should switch dogs occasionally so that rewards are not associated only with one person. Reward pets by treating and petting them for good behavior but being very careful not to reward any inappropriate reactions, such as saying “be a good boy” or “it’s OK” when a dog growls; reassuring a dog when it is acting inappropriately only rewards that behavior. Keep the pets at a distance from each other that they can accept without getting upset.Treats can be given when they are calm or ignoring each other so the presence of the other dog can be associated with a pleasant experience. At any sign of aggression (raised hair on the scruff, neck or back, staring, stalking, snarling, side-by- side posturing with growling or lip-lifting) the distance between the two should be widened immediately and one pet removed to a neutral area as, even if the behaviors are not particularly violent, it is better not to allow negative associations to be created between the pets. The introduction process could take hours or it could take weeks. However long it takes make sure that each pet has some quality time, even if only five to ten minutes a day, with the owner every day. Placing a D.A.P. (Dog appeasing Pheromones) diffuser in each environment used by the dogs, can help lessen stress. A D.A.P. Diffuser contains an analogue of the natural canine appeasing pheromone which can help comfort puppies and adult dogs in situations they may find worrying or which make them apprehensive and help establish them in a new environment (re-homing, moving house, coping with strangers). When the pets are reacting in a positive manner together the restraints can be removed although a water pistol, air canister, fog horn or whistle should always be on hand to interrupt any dangerous situation. Good behavior between the pets should always be rewarded with treats or petting. If the new dog is a puppy, an older pet should never be allowed to be too rough or frighten it.Often it is the puppy who plays roughly with a patient older dog who allows the puppy to pull him or her around. ; This behavior should be controlled as the puppy will learn that this is the way to play with other dogs and sooner or later will find that other dogs are not so patient and will react with aggression to the pup’s inappropriate behavior. The puppy will be frightened by this unexpected reaction and the fear could generalize to all dogs as the puppy grows up, sometimes leading to fear aggression.